Dentists are seeing negligence claims against them increasing. It is essential to find the right Dental Indemnity insurance to protect you and your career. 100% of practices in the Care Quality Commission’s 2017 report were considered ‘caring’ and ‘responsive’ to patients’ needs. However, the number of practitioners being sued has doubled since 2007. Despite patients increasingly receiving much better care from their dentists, claims have increased in many areas, including for diagnosis and treatment of periodontal disease. If successful, these scenarios tend to have significant pay outs. This ultimately means that dentists and dental practices have seen indemnity insurance costs increase, even though their earnings have not followed suit. Looking back further, between 2001 and 2006, the Dental Law Partnership, the biggest legal firm handling dental claims in England, said that the number of claims they had received had quadrupled, and the average settlement rose to £7,980. With this in mind, it is no wonder that most dentists fear being sued. The stress of balancing providing the best quality and right care for patients with not wanting to carry out high risk procedures is taking its toll. In turn, dentists feel that it is easier than ever to bring a claim against them and a full time dental practitioner can expect to fall foul of two claims in their career. 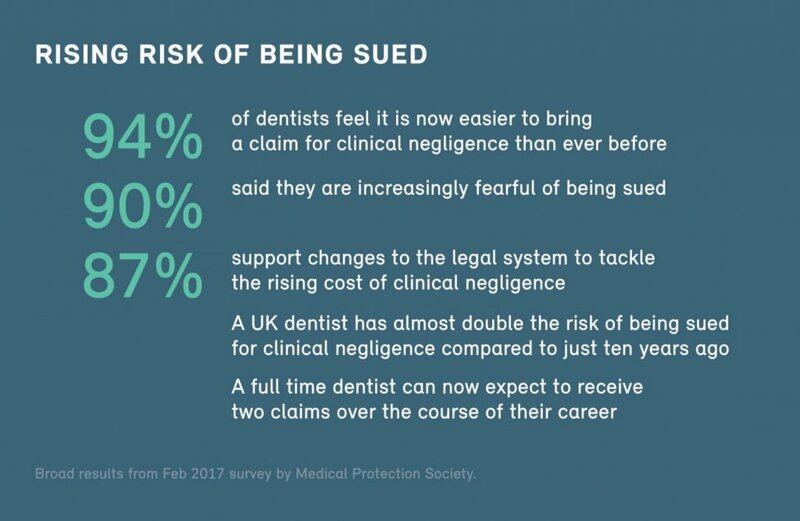 Although dentists support changes to the legal system to challenge the rising number and costs of claims, there are immediate steps that you can take to protect yourself if and when something does go wrong. 2016 winner of the Dental Industry Awards, All Med Pro’s dental indemnity cover is underwritten by Hiscox and provides an excellent level of specialist cover for dentists. Look for contractual cover. Often dentists have a policy that provides discretionary cover from traditional insurance providers such as a medical defence organisation. Contractual cover, as provided by All Med Pro, gives you more rights in the event of a claim against you – ensuring that any eligible claim is paid. Choose claims occurrence indemnity. A ‘claims made indemnity’ policy is only in force when the policy is active. However, ‘claims occurrence’ means that any claim for the period of cover, if it is made after the policy has ended, is still eligible. Benefit from specialist support. At All Med Pro we pride ourselves on our specialist insurance designed specifically for medical and dental professionals. With that in mind, one of the benefits of choosing a dental indemnity policy with us is that you will be able to talk to dental professionals with legal training during the claims process. These people really understand your career, motivations and needs. Take the stress out of a negligence claim with a comprehensive insurance policy from All Med Pro. We will talk you through your situation to help you decide what level of cover you need. Contact a dental insurance specialist at All Med Pro to see how we can help.